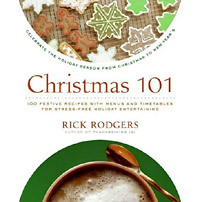 Christmas 101 by Rick Rodgers, author of many cookbooks including Thanksgiving 101, is a handy little book chock full of festive recipes and strategies for making the holiday season funfilled, memorable and delicious. These are 100 of his recipes that he has used over the years for his catering functions and own family gatherings and is not by any means a complete holiday cookbook rather a selection of time tested favorites that work for a variety of special occasions. What it lacks in gloss, Christmas 101 more than makes up for it in function. 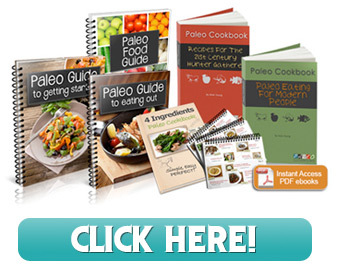 The collection of recipes includes fairly traditional favorites such as Baked Smoked Ham with Pineapple and Seeded Mustard Glaze; Crown Roast of Pork with Apple Stuffing and Hard Cider Sauce; Old Fashioned Egg Nog; Stollen and Roast Goose with Port Gravy along with some new twists such as a much less daunting than the traditional, Chicken Cassoulet, Spicy Cheese Straws and New Wave Egg Nog. His recipes and techniques for such classics as roast turkey, gravy and cookie making are certainly handy to have in one book. Scattered throughout are Rodgers tips and suggestions on those little things that make the holidays more special from low stress decorating ideas; Christmas movies and music and the all important Holiday Menu Planner. Written with both common sense and a dash of humour, Christmas 101 helps take the stress out of the holidays, well the cooking part anyways.